The curtains are about to bust open on for the final act of a fantastic career for David Ortiz. He has one last chapter to write in this career. This season is his swan song. There will be a retirement tour, but Opening Day hasn't come yet and I am already of this retirement tour. Thats right, I'm over it. 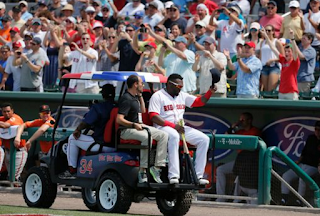 Ortiz deserves everything that he has accomplished in life, but to have a ceremony on the final home game of Spring Training for him is so over the top that when I first heard about it while sitting at my cubicle I almost spit out my coffee and laughed. This is a man who has publicly said that Spring Training is a waste of time, and just a formality that the players go through. But leave it to the Red Sox front office to determine that it is necessary to give Ortiz a send off from Fenway South. There were some nice touches. The large number 34 painted on both sides of the infield grass was a great symbol. 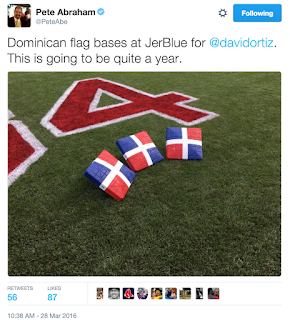 As was using bases that were painted with the flag of the Dominican Republic during warm-ups. I even like that they will name a street on the Red Sox complex, David Ortiz Way. But what I can't stand are the gifts that mean nothing. Chairs from the three ballparks that Ortiz had called home for spring training. What will Ortiz do with a chair from the Minnesota Twins facility? Ortiz hates the Twins. They didn't believe in him, they let him go. Ortiz doesn't want that. And chairs from the last Red Sox facility and now Fenway South? Please, he doesn't want those chairs, especially when he will get a chair from the real Fenway Park during his last home game. And the custom golf cart. I shouldn't even get started on this. 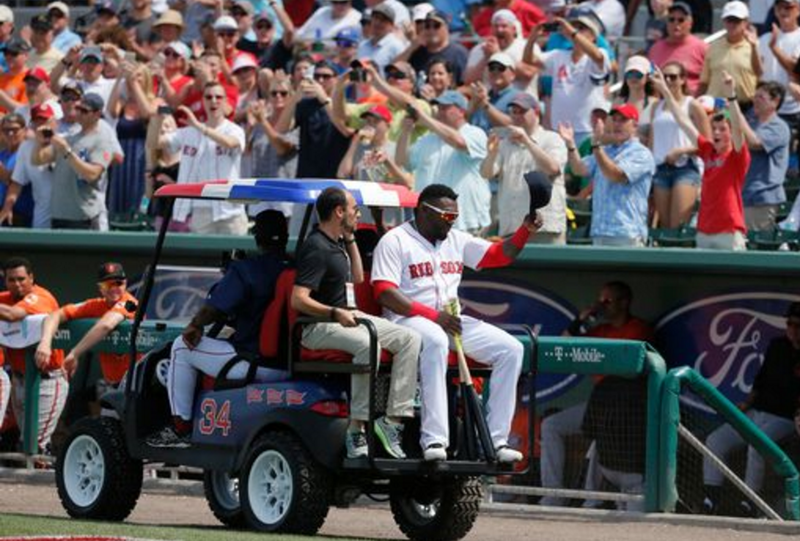 You play baseball for the love of the game, don't bring out a golf cart in the middle of the game and have Ortiz get on it and then drive off into the sunset. It is just so over the top. This is a man who said that he doesn't want a farewell tour, but we all know he will love every minute of the one he will get. He has said that he does not want gifts, and that the best gift would be a donation to the David Ortiz Children's Fund. Listen, David Ortiz is one of my three favorite Red Sox players of all time. You could debate that as a player, nobody has done more for the franchise. I just can't sit around and pretend like all of this is normal or even okay. This is a joint marketing stunt by the front office and David Ortiz to put butts in the seats. David, let's focus this year on what happens in the batters box, not what happens in the pregame ceremonies. Have an opinion on this? Let me know on twitter by clicking here, or leave a comment below.